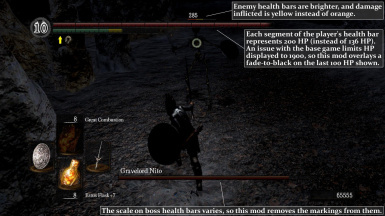 Does this mod increase the max amount of health shown and if so how much? As in, whats the highest amount of max health thats now visible? This Mod is on topic to what I'm trying to find a solution too. I'm trying to make custom HP and stamina bars with cheat engine, but the HUD doesn't properly respond. It does respond to stamina up to 400 which is honestly plenty, but health is capped at 1900 which is 99 vit. I want to play around with custom health bars to make a more casual experience, but since the health bar doesn't represent HP beyond 1900 it's basically useless. I this unfix-able do to the game code or something? Non of the HUD mods on Nexus seem to fix this issue, they're purely aesthetic, thanks. resolution other commonad that triggder this problem? While using this mod, there is no longer and humanity counter in the circle to the left. I prefer to measure health in percentage, and as such, I liked the boss health ruler. Hi, i downloaded this mod, because it looked sweet, but somehow the boss health-bars went entirely yellow, and not anything remotely as it should do, so i deleted it again from the folder, but it still happens.. I'm new to this Dark Souls mods, so a little help..? Thanks for letting me know about your issue. I definitely want to get to the bottom of this, since that's about the opposite of what the mod should do. I need to get a little more information from you, though, so I can try to reproduce the problem myself. - What version of dsfix are you using? - Did you have "enableTextureOverride 1" in your dsfix.ini? Did you have any of the HUD-modifying options enabled in dsfix? - What other Dark Souls mods are you using, and what others have you used before? If you've got the Steam version of Dark Souls, you might try verifying your game cache to make sure all the game files are in good working order. I suspect if something went wrong with the original texture (as your post seems to suggest), that will repair it. - Yes, it's set to 1. I also have 'High-Res UI and Subtitle fonts' which in fact, also doesn't seem to work properly, but that can just be because of some other reasons.. These were directly in the NMM. I have some more, but most of them i can't remember the name of, and as you can see, it's mostly texture fixes i use. I got DS from Steam, and i will try verify it. Should i delete the mods i have installed when i do that? I'm pretty sure Steam's verify only considers the files it installed. I don't remember whether dsfix overwrites any of those. None of the other mods you have should do so; I think you can leave them in place with no problem. I'd just do a fresh install of dsfix after the verify to be safe. Let me know whether your boss health bars are back to normal after the verify. Thanks for working with me on this. When i verified it in Steam, it found one problem with one of the files, and it solved it. When i started a new game and got to the first boss, it showed all of the HUD as it should be. Red healthbar, and all. Then i tried putting your mod on, and when i got to the boss again, it made the same error once more, meaning all yellow hp-bar. I then tried to verify the cache in steam once more, and delete your file, but this time it still makes the error, and no matter how many times i try to verify, it's still yellow..
- Sorry for not responding for so long, but i had some problems with my computer, and steam..
Aah, this is excactly what is wrong. I have the HUD set at 0.75, because that looked cool, but now i see i shouldn't..
Yeah, I found some other graphical issues when I tried out DSFix's HUD mods a while ago (e.g. with the framerate unlocked, the HUD seemed to flicker a whole lot), so I never played with that setting enough to notice the boss health bars issue. It's a shame, because I would use the "minimal HUD" option at the very least, if it worked properly for me. Do you know how much each primary marking of the boss bar represents in the vanilla game? Every boss has a different amount of HP, but each always has 13 segments. Each segment is about 8% of the boss's health. I just uploaded version 2, which removes markings from boss health bars entirely (as well as brightening enemy health bars).